CinemAfrica and the Polar Music Prize celebrates this year’s Polar Prize winner Youssou N’Dour and serves up an inspiring morning with breakfast and three films with a focus on Senegal. Return to Gorée is the main feature, a musical road movie that follows Youssou N’Dour on a journey to find jazz roots. Moderator is Coura Mbaye. Come and settling down in one of Rio’s Bio cinema seats, enjoy the Copacabana good breakfast and start Sunday with three really good movies! 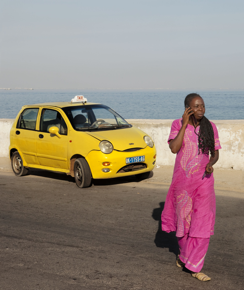 Taxi Sister is a documentary portrayal of the female taxi driver Bourys living in Dakar, Senegal. As the woman behind the wheel, she lives a fast-paced life with palpable everyday drama and she wrestle daily with society’s view of how a woman is expected to be. Today, there are 15 female taxi drivers in Dakar’s streets, but it’s still not much compared to the 15 000 taxi men. One reason I love the CineAfrica series is that it provides a chance to visit Africa without boarding an airplane. To date my travel to Africa has been limited with two visits to Senegal and one visit to Zimbabwe. Both countries provided experiences I will never forget including seeing and feeling Goree Island and witnessing the marvel that is nature on safari. I have promised myself that I will return to Africa and I would like to go on safaris in Botswana. Previous ArticleSweden is like living in Russia.